Glenn and I used to travel a lot. Our favorite thing to do was camping, because we could save money, enjoy the outdoors, and even bring Valentine, our sweet little chihuahua. She loved our travels too. One of our favorite places to go was Big Bend National Park, part of the ruggedly beautiful Rocky Mountains, and located on the Texas – Mexico border. There are a lot of fun things to do and beautiful things to see at Big Bend. The visitor center is very nice. 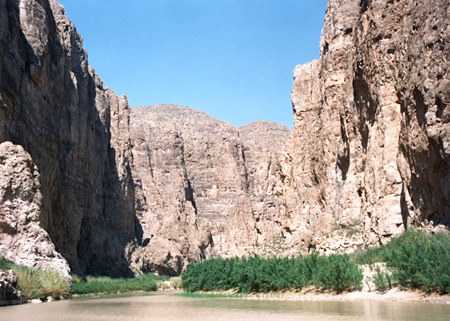 There are beautiful hiking trails, a great natural hot spring, and the Rio Grande River. Now the ferry to Boquillas, Mexico has been opened, I hear. And at Big Bend, they have a great respect for wildlife, so you see a lot of it. The Mexican citizens that live around Big Bend, swim across the river and sneak up to the trails unnoticed, laying out their handmade trinkets. You can leave your money in the jar. Some of their stuff is really neat. They offer nice, painted walking sticks that they make out of the native plants called Agaves, a dessert succulent. The trail that goes to Boquillas Canyon is probably my favorite. It’s not a long trail, maybe a mile. But it’s rocky, and goes up and down a lot. The first time we walked it, Glenn bought me a stick, and one for himself. They really helped, and made great souvenirs, but we found out that we shouldn’t have bought them. The walk there is not scenic as I recall, but once we arrived, we were awstruck by the beauty of Boquillas Canyon, with it’s tall cliffs rising over the river and beautiful horses grazing on green grasses. The flat bank leading up to it is the perfect place to sit and rest for a while. That same evening, we sat on the bank and ate our picnic. While across the river, a Mexican man sat on a hilltop and sang to us. It was so very romantic, a memory I treasure! The park rangers run a tight ship, and they explain the importance of keeping your camp clean. All food has to go in a vault, any left out will encourage the coyotes and hogs. We had gone for a dip in the hot spring one morning and when we returned, a park ranger was waiting for us. We had left a tube of lip balm on the picnic table. He made a big point of telling us not do that again! At night when you go to the bathroom, you’ll probably meet a coyote. They really feel at home, at Big Bend. Pets are supposed to be on a leash at all times. And you hear stories about how the coyotes have come into camp and taken the pets. So we were very cautious with Valentine. Still, we were there for a week, and she had to get off that leash, some. We just tried to watch her close when we let her off. She had a little pink pig toy that she loved. We accidentally left it outside one night, And when we got up the next morning, The tail had been carefully chewed off and left there, beside the toy. That afternoon, we let her off her leash for a little while and she was sniffing around the camp. Suddenly she started running away from camp! Glenn yelled at her in a sharp voice, and she stopped. On the edge of the thicket there was a coyote sitting there in broad daylight, acting playful and making eye contact with her. It was seducing her. She had seen it and started running toward it. Glenn picked her up and brought her back to our camp, but not before scaring off the coyote. It scared me to death! She could have been a salty snack! We will never take her back to Big Bend! When it was time to leave, we packed up and drove about 30 miles to the border patrol station. They saw our walking sticks, and had a fit! Apparently it is illegal to buy those trinkets off the trails. They wanted to search our car, and even threatened to confiscate it. That would have been terrible, we were a long way from home! They finally relented, but they probably held us up for 30 minutes at least. It surprised me though, that they let us keep them! A Big Bend adventure is like no other. It’s a wild place that will touch just about every nerve you’ve got! Seeing it through the eyes of a hiker, rather than from the car window, adds volumes to the experience. It makes a wonderful vacation destination in winter, spring, and fall, but should be avoided in summer. It is a place where memories are made. But, bring your own walking stick, and beware of those coyotes!